I apologize for the lack of updates, I promise to update this site more. Things have been hectic while building the car for this season. We have a month left to finish the car and it will be tough for the next couple weeks. Please bare with me. 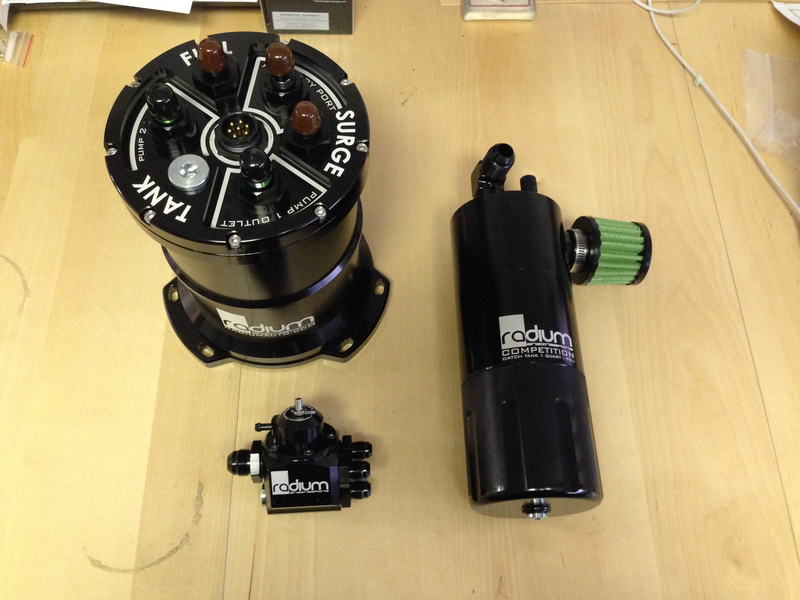 In the meantime check out the cool stuff Radium Engineering set over. We will be running their Multi-Pump Fuel Surge Tank, Competition Oil Catch Tank, and the all new Adjustable Fuel Pressure Regulator. Our car will be ran on E85 fuel and this type of fuel demands roughly 30% extra from your fuel system. On top of that we’re adding nitrous to help spool the turbo so fuel starvation is a no no. Even with these demands I have no doubts about my fuel system for this season. One of the many things that I can check off my “worry” list to focus more on driving. A couple years ago I’ve had the luxury of getting my hands on a few products from Radium Engineering before I even knew who they were or what they specialized in. After tinkering with their products I knew I had to look them up. I love innovative products and their products are just that. Their products not only look amazing aesthetically, but they’re super effective. When I started compiling a list of parts needed for my Scion FR-S build, Radium Engineering was at the top of the list and I had to have their products on my car for my 2014 Formula Drift rookie season. Going forward today I am very excited to announce their involvement in my Formula Drift career. I’m looking forward to running their products on my Scion FR-S.
Garrett turbochargers are used in CART, World Rally, American Le Mans, 24 Hours of Le Mans, Pikes Peak, and now my Toyota 2JZ-GTE powered 2013 Scion FR-S. I am very excited to be apart of the most winning turbo company in the world. With their superior design, I am confident we’ll have a solid engine setup for my 2014 Formula Drift season. One of my priorities for my program was to have the most reliable set up from our Toyota 2JZ-GTE engine. We wanted the engine to be the last thing to keep us from competing so we wanted to use race proven parts in our engine. When it came to choosing a stroker kit and cams for our build it was a no-brainer to run Brian Crower engine components. Brian Crower products are used all around the world and is known to work in the most extreme demands of racing and I’m fortunate to have them on as a partner to my program. They will help us keep our 2013 Scion FR-S on track. Chase Bays got us wired! One of the biggest things people over look when building their car is the engine harness. It’s what controls the heart of your car and having a proper wired engine is super important. Everyone has been there and its no fun chasing down wiring gremlins, but imagine doing that in the hot pits at a race in under 5 minutes. That’s exactly what we want to avoid so we reached out to Chase Bays. Chase Bays is a small business that has been providing affordable and reliable wiring since 2005 and I am glad to have them on board as a partner for my 2014 Campaign. Make sure to check back to see the Wiring, AN plumbing, Brakes, Power Steering, Clutch Lines, and Fuel Delivery products we will be using from Chase Bays! I’m excited to announce a huge partner to our program! They’ve had a year of research and development running the Scion FR-S and the Toyota 2JZ-GTE powerplant in Formula Drift and it was without a doubt a no brainier to reach out to them for support. 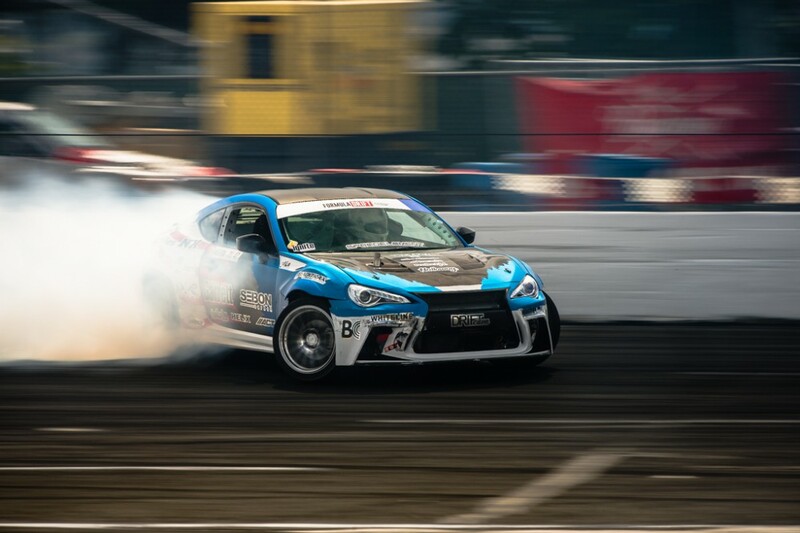 Going forward, I am fortunate to have Portland Speed Industries on as a partner for our 2013 Scion FR-S and to be running the 2014 Formula Drift Season with their knowledge and support.